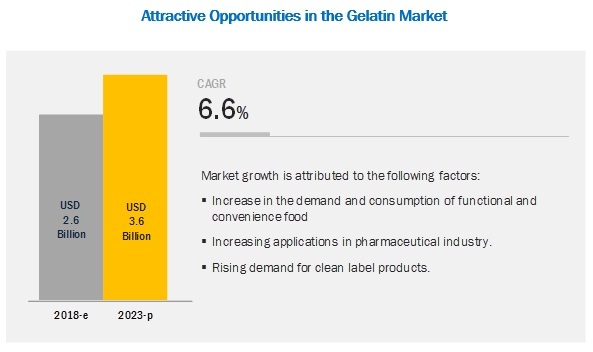 [176 Pages Report] The market for gelatin is projected to grow from USD 2.6 billion in 2018 to USD 3.6 billion by 2023, at a CAGR of 6.6% during the forecast period. The growing demand for functional and convenience food & beverage products, increasing application in the pharmaceutical industry, and the rising demand for clean label products drive the demand for gelatin. The increasing demand for gelatin from the nutraceutical and sports nutrition industrial segment due to its high protein content and increasing applications in the medical and biomedical industries also drive the demand for gelatin. By application, the food segment is projected to witness the fastest growth in the gelatin market during the forecast period. The food segment is projected to witness the fastest growth due to a wide range of applications in food and high nutritional value. Gelatin is a highly rich protein source to be incorporated into functional & nutritional food & beverage products. The rising demand for nutritional food & beverages has been stimulating the demand for gelatin. Gelatin is naturally derived from animal’s connective tissues and considered as a clean label ingredient. Hence, the increased consumer preferences for clean label products drive the growth of the global gelatin market. The porcine segment is projected to account for the largest share during the forecast period. Based on source, the market is estimated to be dominated by the porcine segment in 2018. Pigskin is rich in collagen proteins, which are considered to be more stable in comparison with gelatin from other sources. Most of the gelatin is sourced from animal tissues, as it contains a high amount of collagen. Different methods are used to extract collagen protein, which include the salting out, alkaline, acid, and enzyme methods. Furthermore, increasing demand for sports and nutritional food & beverage products fuels the porcine gelatin demand. Europe is projected to account for the largest market share during the forecast period. Europe accounted for the largest share of the gelatin market. The dominance in this region is attributed to the high demand for nutritional and functional food & beverage products along with the growing pharmaceutical industry. 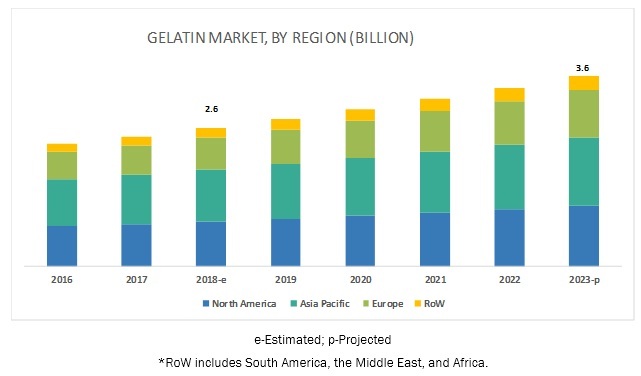 Moreover, the abundant availability of raw materials as well as the presence of key gelatin manufacturing contributes to the growth of the gelatin market in the region. The major vendors in the global gelatin market are Darling Ingredients (US), Gelita (Germany), Nitta Gelatin (Japan), Tessenderlo Group (Belgium), Weishardt (France), Trobas Gelatine (Netherlands), India Gelatine & Chemicals (India), Lapi Gelatine (Italy), Junca Gelatines (Spain), Sterling Biotech Group (India), Italgelatine (Italy), and Gelnex (Brazil). These players have broad industry coverage and strong operational and financial strength; they have grown organically and inorganically in the recent past. Key industry players such as Darling Ingredients (US) acquired Triple-T Foods Arkansas (US), which is a specialty pet food ingredient company. This acquisition is expected to help the company in expanding their premium protein business. In May 2018, Darling Ingredients (US) completed the acquisition of Kruger Commodities, Inc. (US). This helped the company to expand its production business for protein blending operations and cooking oil collecting business. In April 2018, Nitta Gelatin (Japan) launched an ingredient known as “DRG Gelatin,” which is used in soft gel gelatin capsules. This ingredient is used to prevent cross-linkage reactions and enhances dissolution in soft capsule applications. In November 2018, Rousselot, a part of Darling Ingredients (US), partnered with Baker Perkins (US), a food equipment and technology provider company to improve the gelation processes of gummies. In January 2017, Gelita (Germany) invested in Eberbach plant for the construction of ultra-modern facilities. This helped the company to optimize the production process to meet consumer demand for collagen and protein products. Who are the major market players in the gelatin market? What are the regional growth trends and the largest revenue-generating regions for gelatin? Which are the major regions that are projected to witness significant growth for gelatin? What are the major applications of gelatin that are projected to gain maximum market revenue and share during the forecast period? Which are the major sources of gelatin used that will be accounting for a majority of the revenue over the forecast period? The study involved four major activities in estimating the current market size for the gelatin market. Exhaustive secondary research was done to collect information on the market as well as the parent market. The next step was to validate these findings, assumptions, and sizing with industry experts across the value chain through primary research. Both the top-down and bottom-up approaches were employed to estimate the complete market size. Thereafter, market breakdown and data triangulation were used to estimate the market size of segments and subsegments. In the secondary research process, various sources were referred to, so as to identify and collect information for this study. These secondary sources included reports from the Food and Agriculture Organization (FAO), United States Department of Agriculture (USDA), Gelatin Manufacturers Institute of America (GMIA), European Food Safety Authority (EFSA), annual reports, press releases & investor presentations of companies, white papers, certified publications, and articles by recognized authors, regulatory bodies, trade directories, and databases. 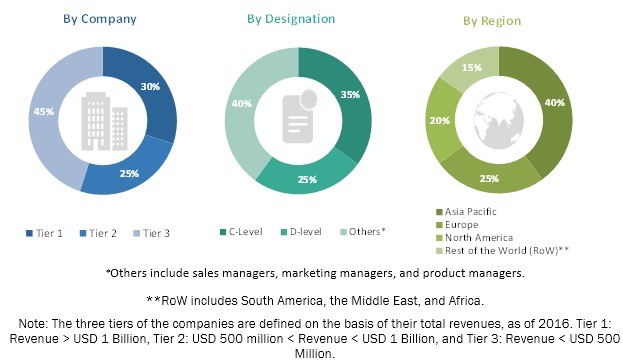 Secondary research was mainly used to obtain key information about the industry’s supply chain, the total pool of key players, market classification, and segmentation, according to industry trends to the bottom-most level and regional markets. It was also used to obtain information about key developments from a market-oriented perspective. The overall gelatin market comprises several stakeholders such as gelatin manufacturers, traders, importers & exporters, processors, food manufacturers, pharmaceutical manufacturers, research & development associations, government organization, and research institutions in the supply chain. The demand side of this market is characterized by the development in the food & pharmaceutical industry across the emerging economies. Various primary sources from both the supply and demand sides of the overall market were interviewed to obtain qualitative and quantitative information. The primary interviewees from the demand side include food & beverage manufacturers, pharmaceutical & healthcare companies, cosmetics companies as well as research institutions involved in R&D to introduce new products. The primary sources from the supply side include key opinion leaders, vice presidents, and CEOs of the key manufacturing companies in the gelatin market, suppliers/distributor, importers, and exporters. The gelatin industry’s value chain and market size, in terms of value and volume, were determined through primary and secondary research. All percentage share splits and breakdowns were determined using secondary sources and verified through primary sources. All the possible parameters that affect the market covered in this research study were accounted for, viewed in extensive detail, verified through primary research, and analyzed to obtain the final quantitative and qualitative data. After arriving at the overall market sizes-using the market size estimation processes as explained above—the market was split into several segments and subsegments. In order to complete the overall market engineering process and arrive at the exact statistics of each market segment and its subsegments, the data triangulation and market breakdown procedures were employed, wherever applicable. The data was triangulated by studying various factors and trends from both the demand and supply sides of the gelatin industry. The market size was validated using the top-down and bottom-up approaches. This research report categorizes the gelatin market based on source, application, type, function, and region. With the given market data, MarketsandMarkets offers customizations according to the client-specific scientific needs.